TORONTO -- Federal regulators have determined that about 4,000 chemicals used for decades in Canada pose enough of a threat to human health or the environment that they need to be subjected to safety assessments. The sheer number of chemicals needing review means there is probably not a person in Canada who hasn't been exposed to some of them. While many are industrial compounds, others are widely used to make everyday products found in practically every home and office in the country, ranging from hair dryers to water bottles, fast-food wrappers, TVs, computer casings and the inside of tin cans. 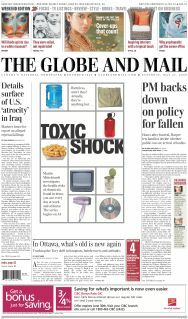 The chemicals needing review were culled from a list of 23,000 substances grandfathered from a detailed safety study because they were in widespread commercial use before Canada adopted its first comprehensive pollution legislation, the Canadian Environmental Protection Act, in 1988. Although federal officials are publicly playing down the huge number of substances that they've deemed need a review, an environmentalist who participated in the federal effort to place chemicals into safe and risky categories was surprised by the magnitude. "We didn't expect that many chemicals to come through," said Fe de Leon, a researcher at the Canadian Environmental Law Association, a non-profit organization that uses existing laws to protect the environment and advocates environmental law reforms. "I don't think Environment Canada and Health Canada did, either." The review has become a pressing health and ecological issue because research is indicating that many substances once thought to be benign could be dangerous. In the past 20 years, hundreds of peer-reviewed scientific papers have linked chemicals in long-term use to a host of health problems and modern disease trends, including learning disabilities, hyperactivity disorders, low sperm counts, altered thyroid function, and breast cancer, among others. Surveys have also found that many of the chemicals causing adverse effects in laboratory animal tests are found in human tissues and in wildlife. Ms. de Leon has seen a preliminary copy of the list of chemicals to be reviewed and said it contained around 4,000 substances she characterized as including "the baddies of the bad." They include bisphenol A, the basic building block for polycarbonate plastic, which is used to make such things as 20-litre water-cooler jugs, coatings on compact disks, and Nalgene water bottles. It's also a component in dental sealants for children's teeth and is found in the resins that line almost all tin cans sold in North America. The list also includes some types of perfluorocarbons, which are used to make non-stick, stain-resistant or water-repellant products and are commonly found in fast-food packaging, furniture, clothing and cookware. The approximate size of the list has been confirmed by David Morin, an Environment Canada official who has worked on classifying the chemicals. Health Canada said in a statement that it has identified "a large number of chemicals for further study," including bisphenol A. Environment Canada and Health Canada are required to make public the names of all the chemicals they believe need safety assessments by Sept. 14. Although most substances in use today have been tested to see if they are acutely poisonous, many haven't been subjected to the kind of in-depth analyses that would determine whether they cause cancer, disrupt hormone functions, interfere with fetal development or accumulate in wildlife. Some environmentalists contend that allowing tens of thousands of chemicals to be used without full knowledge of their effects is a major regulatory lapse. "There is clearly a significant, present, growing health risk from a lot of these chemicals," said Rick Smith, spokesman for Environmental Defence, an activist group that last year found residues from chemicals in consumer products in the blood of every Canadian they monitored. He called for the government to ban or restrict the most dangerous of the 4,000 chemicals, an approach that he said would deal with "the worst of the worst." For the past seven years, federal health and environment scientists, along with environmentalists and industry representatives, have been going over the list of grandfathered chemicals. Under federal law, these are defined as substances that were used in Canada between 1984 and 1986, so it includes many chemicals developed in the 1950s and 1960s, and even earlier. They have concluded most of their work, leading to a fairly accurate estimate of the total that will need further study. "They are essentially done," said Ms. de Leon, who was critical of the length of time it has taken to see which chemicals are safe. "It boggles my mind." Canada is one of many countries around the world that is investigating the safety of chemicals that are in use but have never been subjected to full reviews. Most of these chemicals escaped detailed scrutiny because they were developed before modern pollution laws existed. When those laws were established, it was common for governments to exempt existing substances from the more rigorous evaluations they started applying to any new chemicals. In Europe, about 100,000 chemicals were on the market before 1981 and were exempt from detailed reviews. European regulators say that safety information is sketchy for around the vast majority of these chemicals. Since 1981, about 4,300 new chemicals have been subjected to in-depth testing. Canadian regulators say their evaluation of the 23,000 grandfathered chemicals is the most comprehensive such action in the world, and puts Canada ahead of both Europe and the United States in terms of chemical safety. "The government of Canada is now leading the world in addressing chemicals introduced" before modern pollution laws, Health Canada said in its statement. whether their extensive use means they present the greatest potential for human exposures. An Environment Canada official said that just because a substance meets the threshold for further review doesn't necessarily mean it will be found to be a health danger. The full extent of the hazards won't be known until the government conducts assessments on the individual chemicals and determines actual human or animal exposure levels. It is not known how long this process will take. "Because the substances meet the criteria does not mean that they pose a risk," Mr. Morin said. Canadian regulators and those in other countries have been surprised in recent years to find that some chemicals they permitted to be used for decades without much scrutiny were suddenly found to be harmful. Many involved substances destined for use in consumer products. In 2000, 3M Co. announced it would phase out perfluorooctanyl sulfonate, a substance used to make one of its signature products, Scotchgard. PFOS, as it is also known, was found to be widely present in human blood samples across the U.S., and in wildlife. Laboratory testing on rodents indicated it also killed rat pups born to mothers that had been exposed to the chemical. In January, E.I. du Pont de Nemours & Co. and seven other big chemical producers agreed under a deal with the U.S. Environmental Protection Agency to sharp reductions in emissions from their products and factories of perfluorooctanoic acid, a chemical used to help make Teflon brand non-stick products, among other things. The chemical has recently also been deemed a likely carcinogen. In another case, Great Lakes Chemical Corp. agreed to phase out by the end of 2004 two chemical flame retardants accumulating in wildlife that have been found to induce attention deficit and hyperactivity symptoms in laboratory animals. The flame retardants had been widely used for years in foam mattresses and computers. Ms. de Leon said current approaches to chemical safety haven't been adequate. "We just thought that chemicals stayed inert in products and this evidence suggests that no, they escape," she said. "We need to have a better framework to deal with them." Chemicals are everywhere, so how can you live contact free? Flame retardants may save lives in fires, but are they toxic?